This beautifully crafted oil includes an elegant blend of precious plant and essential oils, that can be used on your face, body and hair. Skin is nourished and instantly glows with health and vitality. Hair looks silkier, stronger with a gorgeous shine. And the blissful aroma helps restore inner peace, leaving you feeling pampered inside and out. Suitable for all skin types. Raspberry Seed Oil, Evening Primrose, Tamanu, Rose Hip oils, Sunflower Seed, Apricot Kernel, Sweet Almond, Argan Oils, Jojoba Seed Oil. 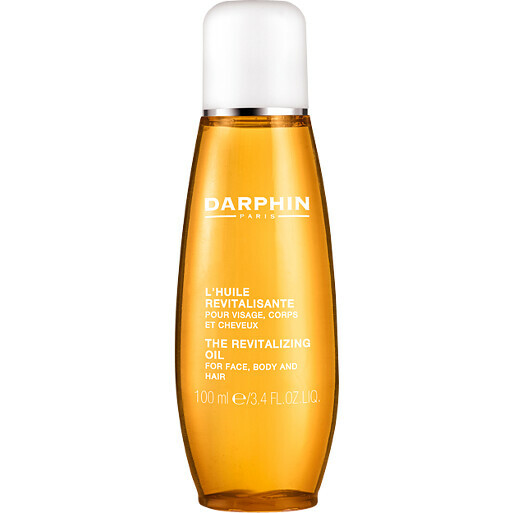 Darphin The Revitalizing Oil is rated 4.7 out of 5 by 3. Rated 4 out of 5 by ribenaki from A great little find I was looking for a niurishing oil for my chest and back where the skin is often parched and dry. I was using a body lotion before which did not seem to moisturise that area enough. I have heard of using oils as an alternative so decided to try it. I have not tried any of the Darphin products before but the customer reviews ratings sounded much better than other similar products. And they were true. The oil is very nourishing and makes my skin feel glowy and hydrated. I am not particularly keen on the scent but its not strong either. I gave it 4 stars because getting the lid off was hard work. Rated 5 out of 5 by Hiu123 from That smell tho the most relaxing smell that I have ever smell!!! I would apply this oil to my neck just before sleep so that I could smell it during my sleep. This is a dry oil formula, and it is just amazing! !